Yuletide shopping has started - or at least looking around at things I might buy or others or want for myself. As a blogger, I'm also getting sent a lot of pressy-related press releases. Some of them even tempt me - like the one I got from Robert Dyas for the Harry Potter Potion Bottle Mood Light. The household goods store said something I agree with: "Christmas is the most magical time of the year, with the nights drawing in, the soft glow of twinkling lights and the sense of anticipation in the air. There really is a belief that anything could happen." 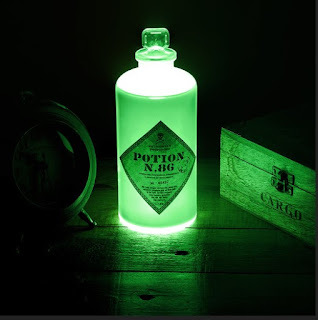 It goes on to say: "Be spellbound by the Harry Potter Potion Bottle Mood Light. Shaped like a bottle of magical potion, there are two light modes allowing for a magical twinkle or eerie mood lighting. An ideal gift for any Harry Potter fan as it captures the mysterious essence of the wizarding world." I've posted the picture of the Harry Potter Potion Bottle Mood Light, which the press release says costs £19.99. It might even go on my wish list.